This is probably the biggest lesson/activity I’ve put together this year. Thanks to today’s snow/ice day, what was going to be spread out over 3 days will now have to be done in two. I think it’ll be doable. First, I’ve made it a contest. There are nine total videos of people shooting a basketball. 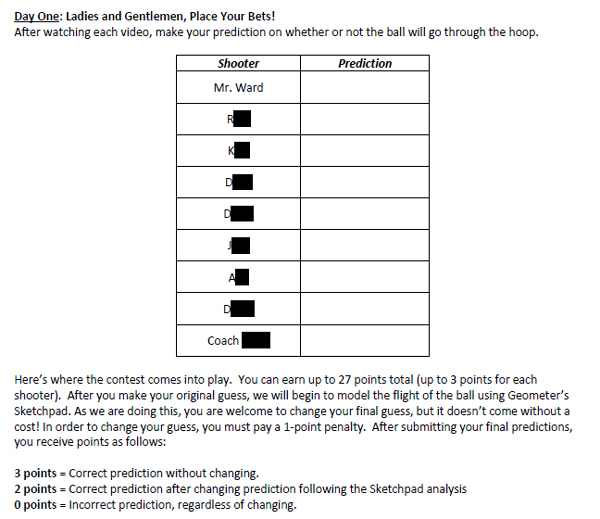 Students will watch Act 1 for each shooter and make their prediction. Does it go in, or not? Correct predictions are worth 3 points. During Act Two they’ll have the chance to change their prediction, however it will cost them 1 point. If they are wrong, they receive no points. I’ll go through showing the nine Act Ones, as seen below. Students will make their guess. Very low entry bar. Anyone can make a guess. 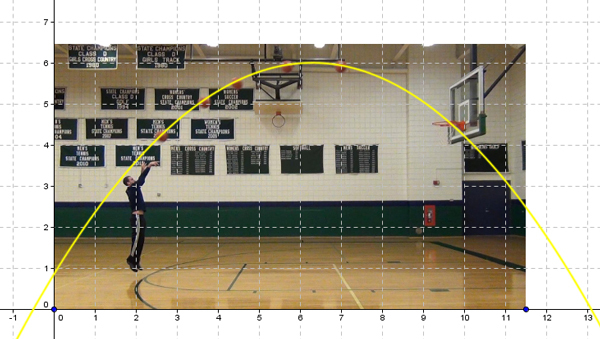 Then we’ll go into Geometer’s Sketchpad and start modeling parabolas. Here is where the competition gets interesting. Once students model their equation, they may decide their original guess was off. That’s fine, but it’ll cost them a point if they want to change. That should provide a little incentive to be as precise as possible in their modeling. This screenshot is in Geogebra, but my students will be working with Sketchpad, which should allow things to be a little more intuitive. I’ll set them up with a standard parabola in vertex form: y = -0.5(x – 2)^2 + 2. That should be plenty to get them going and graphing. As they progress through the shooters, they get more difficult. One picture will have a random three balls in the picture. One picture has three balls very close to each other, right after they leave the shooter’s hand. One shooter hits a bank shot which should really throw people off. I’ll have them record their equations and record whether or not they want to keep their prediction, just to keep them honest. The next day we’ll come back and reveal the results. Why is the value of a negative? What happens if it is positive? Describe what happened when you changed a. What happened when you made it smaller? Bigger? Describe how h and k changed. What does the point (h, k) represent? What does the line x = h represent? As for the contest? Whoever wins gets to add their video to the library for next year. 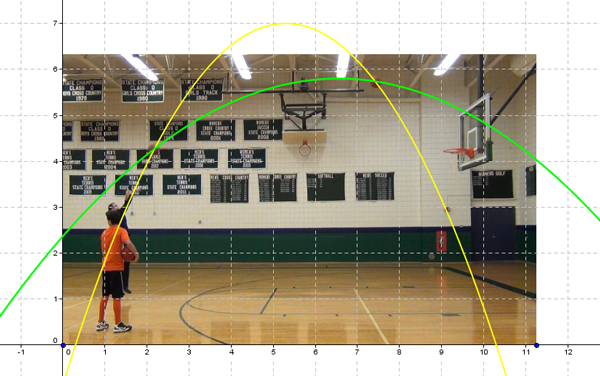 In fact, this is what I hope we get to if the students are able to model the first nine shots quick enough. Had I still had 3 days instead of two, I’m sure we could have. This is a pretty obvious way to show, graphically, that having only two points is not sufficient to graph a quadratic function. You could also talk about other curves instead of parabolas, too. I’ll be very interested to see what other questions come up in class.